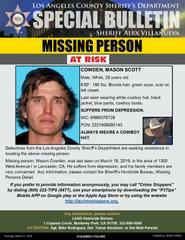 Los Angeles County Sheriff’s Department’s Missing Persons Unit detectives are seeking the public’s assistance in locating Mason Scott Cowden. 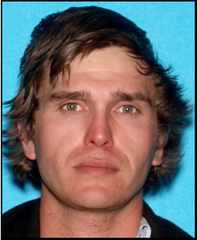 He is a 26 year-old male White who was last seen on March 19, 2019, in the area of the 1300 block of West Avenue I in Lancaster. Mr. Cowden is described as 6’0”, 180 lbs., blonde hair, and green eyes and has a scar on his left cheek. He was last seen wearing a white cowboy hat, black jacket, blue pants and cowboy boots. Mr. Cowden suffers from depression and his friends and family are concerned for his well-being and asking for the public’s assistance in locating him.